Join us online for our monthly women's networking series, After 6: Career Conversations. 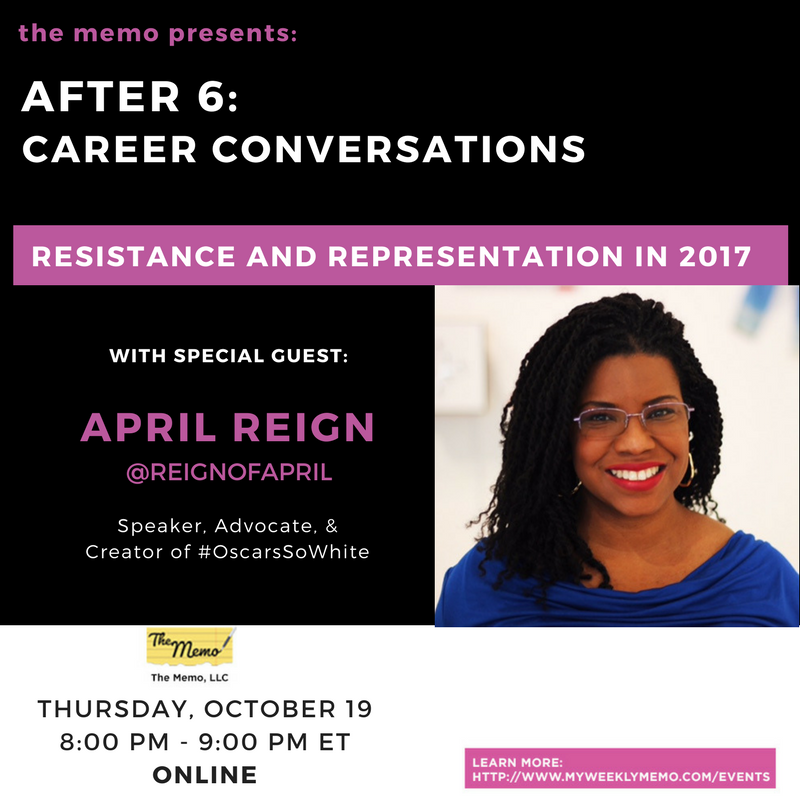 This month we are discussing Resistance and Representation in 2017, with our special guest, April Reign. After 6 is a chance for you to connect with other like-minded women. April Reign practiced law for nearly twenty years, honing her talent for public speaking and persuasive writing, but it wasn't until she walked away from her legal practice that she found her true passion. Now, Reign is able to capitalize on her strengths and pursue her calling, using her voice to spark dialogue and explore issues of race, politics, and culture. As the Creator of the viral hashtag #OscarsSoWhite and the co-creator of #NoConfederate, April Reign challenges the lack of representation of marginalized communities in Hollywood and beyond. Reign sustains a movement that has resulted in the most systemic change ever seen in the over 80-year history of the Academy of Motion Picture Arts and Sciences. April Reign owned her opportunity, the results of which are reverberating throughout the entertainment industry.